How do I restore a wallet from a backup file in MultiBit HD? If I have a backup file like mbhd-*.zip.aes how do I restore it using only my password? When I click on Restore Wallet, it only asks for the wallet words, not the file path or password. A wallet backup, kept in the cloud, encrypted by the wallet words. A password, kept in your head. You have 2 and 4, but not 1 or 3. My understanding is that that's not enough to restore your wallet. If you had your wallet words, or access to the computer that created this wallet, it would be different. Not the answer you're looking for? Browse other questions tagged wallet multibit wallet-recovery or ask your own question. MULTIBIT: How to restore wallet with following information? 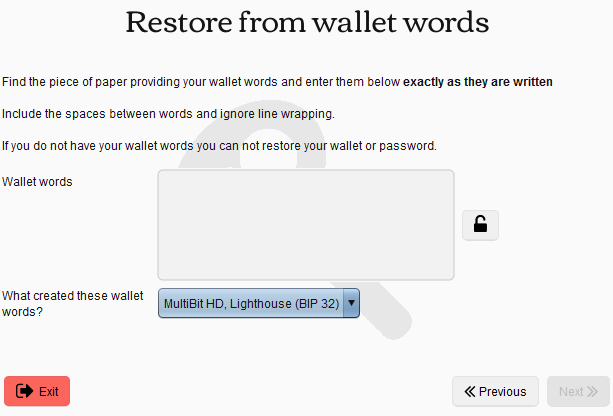 How do I restore my Multibit wallet without seed words?